Many people have the dream of designing and owning their home. In fact many of us know your home is your castle. This is where you spend so much of your time. Other than your work setting there is no where else you going to be for even a close amount of time. When you think of it that way you quickly realize why not live in a home that is perfect for you! This is something you can accomplish when you start with a blank sheet of paper and go from there. This procedure could result in some extra cost over accepting what is out there already built, but maybe not! 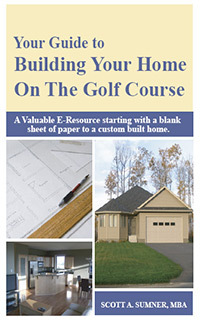 This book, Building a Custom Home On a Golf Course, is about helping you go through the process and making the best, most informed decisions you can. When you are thinking about spending quite a large amount of money as you do on a home it is smart to be as well informed as possible. My goal with Building a Custom Home On a Golf Course is to provide you with some important information I learned while building my home at the Whitewater Golf Course in Thunder Bay, Ontario Canada. Whitewater is a Tom McBroom design, one of Canada’s foremost architects and opened in 2004. My house was completed late 2005 in time for the Christmas season. I hope you enjoy the process I went through and it helps you build your custom home. I would like to thank my mother and father, Barbara and Alan Sumner, for always being my biggest supporters. How lucky we are to have had wonderful parents.